It was a movie date my two boys had long been waiting for! And when hubby came back from his monthlong business trip from the East Coast, Ironman 3 was immediately scheduled. Of course, Little Ironman is where Ironman is! He was soooo mighty proud of himself whenever people around us take notice of him and his Ironman suit. 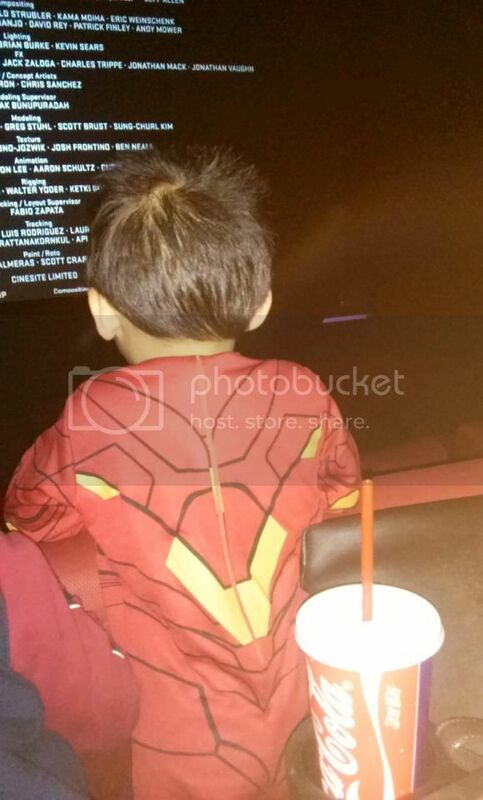 My Little Ironman was almost crying during the first part of the movie especially when Ironman plunged into the water. He was snuggling up to me and he kept on saying, “I don’t want Ironman to die”. It was a little tough for him who thinks the world of Ironman. His Dad eventually had to put him in his lap to assure him. When Ironman started to fight back, our Little Ironman’s energy came back. Throughout the movie, our Little Ironman kept on asking, “When is Ironman going to fight?” I guess, this is pretty much the sentiment of some moviegoers who expected Tony Stark to be in his suit for most of the movie time. I didn’t mind, though. I was still watching the witty and charming Tony Stark, albeit a little bit disturbed due to the anxiety angle that his personality is going through. Indeed, you can take the Ironman suit out of Tony Stark but he remains to be “the Ironman”.